Writing conditional (if/then) statements into ArcGIS Field Calculator using Python Parser? I have gotten stuck on seemingly simple ArcGIS field calculator python expression. I obtained a great answer to a another similar question a few years ago: Using Range in Python expression of ArcGIS Field Calculator?. Now I need to populate a new field based on 6 ranges of values (bedrock depth). I just need to populate the empty field "bedrockdp" using the ranges in the toc called brockdepmin. return "0 - 50 cm from the surface"
return "101 - 150 cm"
return "151 - 200 cm"
return "201 - 250 cm"
return "251 - 1000 cm"
This will populate the text that is in the legend using the GRIDCODE as the numeric source. Not the answer you're looking for? Browse other questions tagged arcgis-desktop arcgis-10.1 field-calculator python-parser if-else or ask your own question. Using Range in Python expression of ArcGIS Field Calculator? 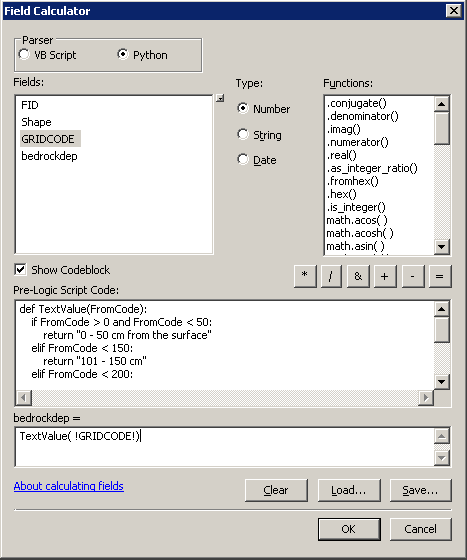 Using Field Calculator with Python Parser and if/elif statements in ArcGIS for Desktop? Creating If Then statement in Field Calculator between 2 values? Using ArcGIS Field Calculator to change text to digit? Using nested if statements in Python Parser of ArcGIS Field Calculator? Using conditional statements in ArcGIS Field Calculator? Debugging error 000539 from ArcGIS Field Calculator? Converting values in datetime field to strings in text field using Python parser of ArcGIS for Desktop? failed to Writing conditional (if/then) statements into Field Calculator of ArcGIS for Desktop using Python parser? Setting up Concatenation using Python expression in field calculator? Using elif statements in Python parser of ArcGIS Field Calculator? Writing If-Then statement in ArcGIS Pro field calculator using Python?